Kiddieland ECE has multiple programs educating children from 6 weeks old through 12 years of age. Chronological age, developmental readiness, and enrollment availability are some of the evaluating criteria used to determine a child’s developmental readiness to proceed from one program to the next. Advancement to the next program happens at the beginning of the school year. On occasion, teachers may initiate the advancement of a student mid-year, if the student is showing signs of developmental readiness and enrollment is available. The Program Director and teachers work very closely with the students and the parents to insure a successful transition from one classroom to the next. Learning Bambini: Our infant classroom schedule is based on each child’s individual needs, wants, nutritional guidelines, and any other special attention he/she requires. Teachers work with each infant as he or she moves toward greater independence, from rolling, sitting, and eventually crawling. Tummy-time is a common sight in the Infant Room! Children are involved in small group activities such as: storytelling, singing, dancing, and playing. We have created a safe environment with a variety of stimuli. Warm and nurturing interactions with caregivers, days spent in a home-like environment for learning, individualized attention and experiences, and meaningful partnerships with parents are the cornerstones of our program. Little Explorers: Families’ busy, curious child learns about who she or he is in the world around them. Toddlers program begins laying a foundation of literacy and math concepts in a classroom set up for maximum exploration. At this age, children expand their curiosity and begin to explore the world around them by using their new gross motor skills (crawling and walking.) Through daily routines and play, children are involved in an early stimulation program with the following characteristics: Teachers constantly talk to children and naturally expand children’s language. Children are involved in small group activities such as: storytelling, drawing, singing, dancing, and playing. Teachers provide children with age appropriate toys to explore and enhance their curiosity. They help children exercise to promote their motor development and encourage children’s self-awareness and individuality by talking about their physical and emotional changes. 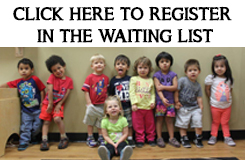 Primary Preschool: Our program will provide age appropriate and individualized activities for young children. At this age, children explore ways to become independent. The teacher’s role is to support children’s desire to do things by themselves. Children’s classrooms are organized into learning centers. The most common learning centers are: dramatic play, sand and water, blocks, art, science, writing and reading. However, each teacher may create or name their own learning centers in accordance with the children’s interests. Our programs’ curricular goals for primary preschoolers have the following characteristics: Teachers talk to children clearly, and respond quickly and appropriately to children’s verbal initiatives. They provide large amounts of uninterrupted time for children to participate in activities of their choice. Teachers provide children with a variety of materials to explore and talk about the world. Art, music, movement, crafts, drama, and others are strongly encouraged in order to give the children the means and opportunities to express themselves. Teachers create learning opportunities such as puzzles, pegboards, beads to string, construction sets, art, and writing in order for children to develop their fine-motor skills. Teachers guide children to understand and respect the rules. Rules are usually negotiated with the children in order to give them ownership of their own behavior. Children are read to on a daily basis. Adults read to children out loud and provide children with a variety of books for them to enjoy. Preschool Preparatory: Our daily routines provide them with a strong language and literacy foundation, and also build on math concepts. At this age, children are more independent and able to manipulate their environment. As they grow, they are better able to understand other points of view. The Preschool Preparatory classroom is also organized into learning centers. The characteristics of our program at this stage are: Children are constantly spoken to and given opportunities to express themselves. Children are expected to be physically and mentally active in activities of their choice. Children meet as a group to share in the planning and execution of group activities. Children work individually or in small, informal groups most of the time. Children are provided with many opportunities to develop social skills such as cooperating, negotiating, and talking to other people in order to solve interpersonal problems. Teachers prepare a stimulating, challenging, and meaningful environment where children are able to meet their needs in all developmental areas: physical, social, emotional and intellectual. Children are read to every day. Teachers demonstrate reading and writing as way to communicate and interact with others. Kinder Foundation: Our program will provide age appropriate and individualized activities for children. At this age, children are given opportunities to explore with different languages or sign systems (reading, writing, drawing, dancing, singing, constructing, and so on.) Children are given opportunities to develop understanding of concepts about themselves, others, and the world around them through observation, hands-on activities and interaction with others. Learning about math, science, social studies, health, and other content areas such as computer technology are all integrated through meaningful activities. Children have daily opportunities to use large muscles for running and jumping. Aesthetic expression and appreciation through art, music, and drama play a key role in this classroom. Children’s emergent interests and activities are posted as teachers keep track of their goals. Junior Scholars: Your child will gain independence while getting ready for the transition to kindergarten with a more organized environment. Each day your child will complete a variety of projects, doing simple addition and subtraction, materials exploration, musical expression, and fine art activities. Children are given opportunities to develop understanding of concepts about themselves, others, and the world around them through observation, hands-on activities and interaction with others. Each day is packed with carefully designed activities structured around the seven domains of curriculum. Children leaving the Junior Scholars classroom are fully prepared for a life of educational success. Tutoring Center: Enrolling children at Kiddieland ECE Tutoring Program is the first step in helping children achieve academic success! Once the children are in school, families may need help before and after school. Our tutoring center has limited and reduced space available. This program was created to ensure families care for their children continuing after school. Our clear mission for every child who studies with us can truly help children develop skills that will last a lifetime. We also pick up and drop off children from the community elementary schools. Children enrolled in our tutoring center will develop stronger academic skills in Reading, Math, Writing, Science, and Technology. Secondly, children will develop better concentration, focus, and attention span with stronger study skills. Thirdly, children will gain more confidence and motivation through socialization and performing fitness activities. I feel strongly that in today’s competitive academic environment, every child requires some form of outside academic assistance – whether they are having difficulty or excelling in the classroom. But most importantly, the earlier children get started with us, the more they will excel and the less chance they have to develop poor work habits and weak academic skills. When families enroll with us, they will help turn children’s future from a day-to-day challenge into a lifelong success story. Full-Day Summer Camp: Registration begins April 1st and ends April 30th. When children are excited that school’s out, it is time for our summer adventures to start. Our Themed summer program will keep children learning with an all-day, all-fun program. Campers will find a balance between planned activities, new challenges, and age appropriate activities involving both indoor and outdoor doings and use of large and small motor skills under safe supervision. Summer Camping at Kiddieland ECE allows the children to “break away” and leaves them rejuvenated to return to the more diligent nature of structured activities during the school year. They are allowed the freedom to invent their own projects, are physically challenged, and have a chance to participate in our organic garden and learn new skills. The schedule is flexible and offers security, independence, and stimulation to meet the needs of the child. Kiddieland ECE offers a variety of unique and exciting Enrichment Camps and Special Interest Clubs to inspire and educate the camper. We believe that in addition to developing academic skills, we must also offer a wide range of extra-curricular opportunities that provide experiences of success necessary to build personal confidence and self-worth. Kiddieland ECE offers opportunities for students to explore and develop their interests and talents through a wide variety of extracurricular activities. We offer different extracurricular activities depending on interest such as: Computer Classes, Second Language, Music Lessons, and many others. Check with the Center Director to find out what programs are currently being offered. If there is a preference for a program that is not currently offered, please let us know. We would be happy to add such a program if there is sufficient demand.